Millions of dollars are being spent to take vaping away from us. It's do or die time, right now. And a few dollars from you can help save the vapor industry. The millions of dollars being spent to take vaping away from us come from just a few very deep-pocketed sources in Big Tobacco and Big Pharma. But there are millions of us vapers, so even small donations can add up. Give SFATA the chance to fight back, and to give vapers and the vapor industry a much louder, united, pro-vaping voice in Washington DC. Your donations will be used for television and print advertising, lobbying federal and state legislatures, pro-vaping publicity, new vaping research, and social media. All dedicated to saving the vaping industry from excessive regulation and taxation, biased science, inaccurate reporting, and unfair competitive practices. 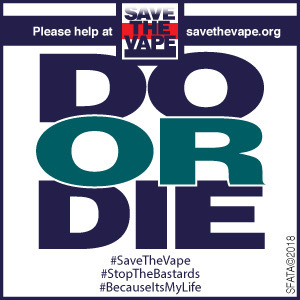 Donations of any size are welcomed from SFATA members, non-members, businesses large and small, and from individual vapers who want to protect and preserve their right to vape. And many thanks for your support.